India has slammed Pakistan for raising the Kashmir issue at a UN General Assembly session, saying it has become Islamabad's habit to misuse any forum for "narrow political gains" and asserting that the right to self-determination cannot be abused to undermine a nation’s territorial integrity. First Secretary in India's Permanent Mission to the UN Paulomi Tripathi was responding to Pakistani envoy Maleeha Lodhi's remarks at the session that the struggle of the Kashmiri people for their right to self-determination has been suppressed for decades. Lodhi said that the Kashmir issue will remain on "the UN agenda until the Kashmiri people are allowed to exercise their will, according to the agreed method prescribed by the Security Council - a plebiscite under the auspices of the United Nations." 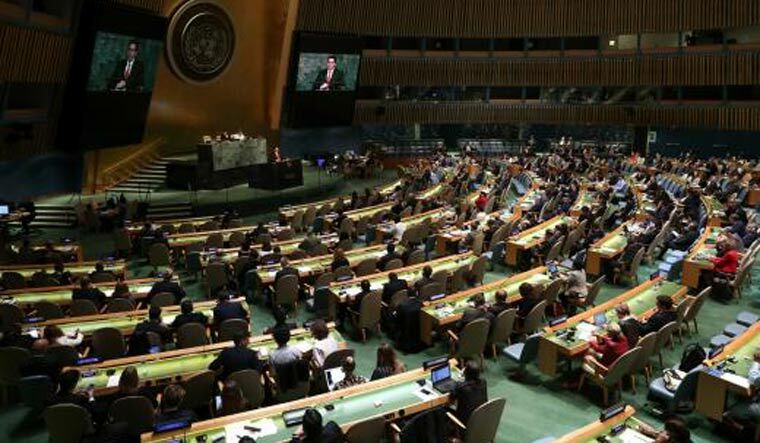 "We reject the unwarranted reference made by one delegation to the State of Jammu and Kashmir which is an integral part of India," Tripathi said at a UNGA Third Committee session Tuesday on Elimination of racism, xenophobia and Right of people to self-determination. She said that it has become Pakistan’s habit to misuse any forum for narrow political gains. "In reality, it is the people of India as well as of our region and beyond, have to suffer most egregious violation of human rights inflicted by terrorism emanating from beyond our borders," she said. "The right to self-determination cannot be abused and misrepresented with the aim of undermining the sovereignty and territorial integrity of a Member State," Tripathi said. She asserted that self-determination has long been recognised as the right of peoples of non-self-governing colonies and trust territories to independence and self-government. Pointing that there are still 17 non-self governing territories which are in various stages of decolonisation, Tripathi said the international community must step up efforts to reach the conclusion of this long-drawn process. She described Palestine as the "unfinished task" in the realisation of the right of people to self-determination, saying India is committed to the cause of the people of Palestine and the country has substantially scaled up bilateral development partnerships and increased contribution to the UN Relief and Works Agency for Palestine Refugees in the Near East (UNRWA). "Rise of exclusionist ideologies inciting discrimination and violence threaten to subvert the globalised economic order and social cohesion," she said stressing that there is need for comprehensive legal and administrative responses to counter emerging challenges. "We must acknowledge that racial equality and freedom of expression need not be pursued in a zero-sum manner," she said adding that private entities including conventional and social media and civil society need to develop and observe codes of conduct that embody commitment to racial equality and non-discrimination.